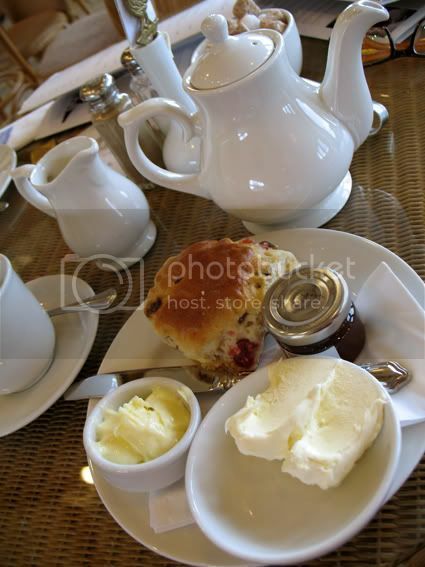 I know this hasn't really got anything much to do with food at all , apart from the cream tea bit, but my sister and I went to Chadsworth today. I just thought I'd just tell everyone, because we had a lovely day out, the place is really beautiful and if you're ever anywhere near I'd really recommend a visit. 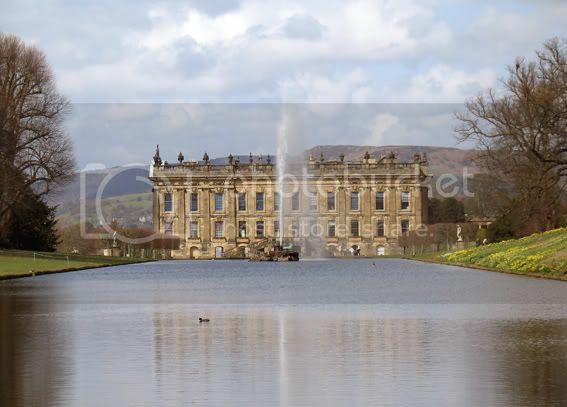 Chadsworth became Mr Darcy's home, Pemberton Hall, in the latest film version of Jane Austen's Pride and Predjudice with Keira Knightly and Matthew Macfadyen. Unfortunatly, Mr Darcy was nowhere to be seen. No dark and brooding figure appearing through the mist (well, now that would have been difficult as the sky was quite blue and the day sunny) or emerging from the pool, wet shirt clinging to his chest but here are some more pictures from the day anyways. Here in the UK the clocks finally went forward to Summer Time last night, so that can only mean one thing (apart from missing an hour of sleep)...more light to photograph food in! It makes such a huge difference and I'm always looking forward to the time of year where I have enough light at dinner time. 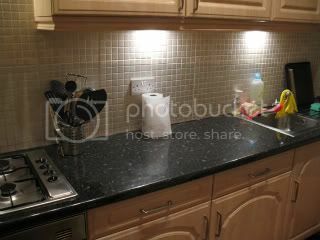 My kitchen lighting isn't that bad, but nothing can beat natural lighting apart from maybe a photo studio. But since I don't happen to have one around at home and I'm not gonna start taking plated up meals into work to use the studio there (they already think I'm strange enough), my dining room window sill in daylight will do just fine! Place half of the tortillas flat onto a work surface. Divide the prosciutto ham between them and top with the gruyere. Top with the four remaining tortillas. 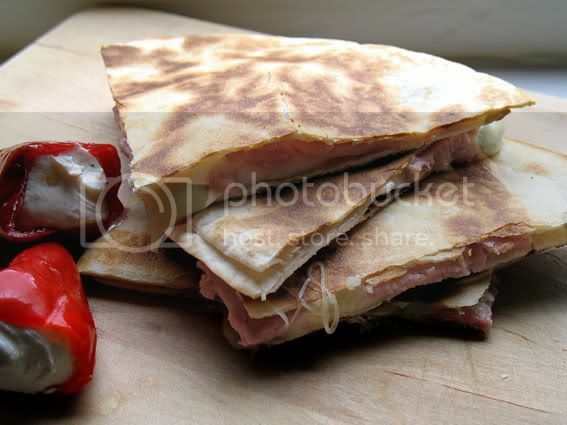 Heat a little olive oil in a large skillet, add one tortilla sandwich at a time and cook on medium heat for approximately 2-3 minutes before carefully turning and cooking the other side for a further 2-3 minutes. Remove from pan and keep warm whilst cooking the remaining tortillas. Cut into wedges and serve with fresh rocket. Tomorrow my big sister is coming to stay for a week. She, like the rest of my family, lives in Germany, so I'm always really happy when I get to spend some time with any of them, as it only happens a couple of times a year. I spent most of today just pottering around the house, tidying things away, doing laundry and getting the spare bedroom sorted out. Thankfully, she won't be checking in corners and under beds, so I don't have to do a major spring clean. It'd be a different story if my mother came to visit. 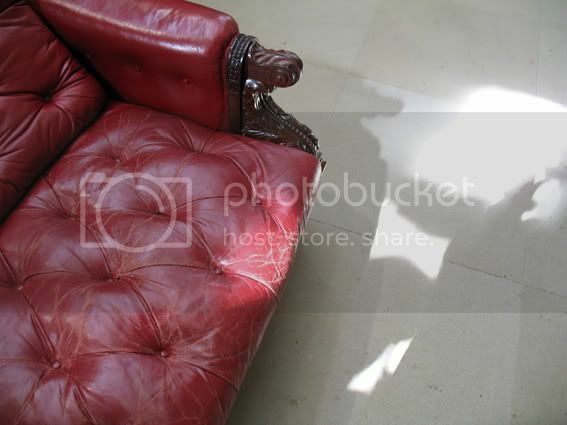 Even though my mum obviously doesn't check under beds either (or at least I think she doesn't), I always start a major cleaning operation when she comes, as her house always seems to be spotless and I get conscious of things I usually don't even notice. My sister doesn't really cook much, so she always says she looks forward to coming here and being cooked for, which means I'll probably do quite a bit of it over the next week, but I don't know how much time I'll have to write about it. So there might be a backlog of stuff to post by the time the week is over, but I'll make sure I make a note and take a pic of everything to share later. For now I'll leave you with my version of Ratatouille. 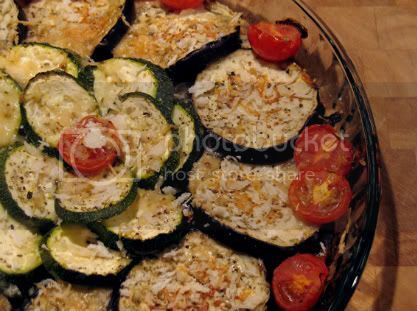 Full of vegetables and wonderful flavours, I like it with pasta, as a filling for a baked potato or even as a kind of sauce/side with pork, fish or chicken. It can be eaten hot or cold. You can also change the quantities of vegetables and use more of one and less of the other, or try adding mushrooms for example. It adapts well to whatever is in your fridge. Heat a little oil in a large, heavy based pan. Add the onions and fry for 5 minutes. Now add the peppers and fry for 2 more minutes. 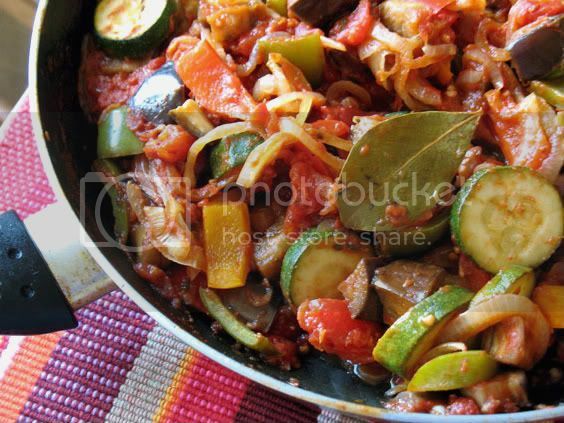 Add a little new oil to the pan and fry the aubergines for 5 minutes, then add the zucchini and fry for 3 minutes. Add the garlic, bay leaves, thyme, sugar and tomatoes to the empty pan and simmer until the tomatoes start breaking down. Return all the vegetables to the pan and simmer on low for about 15 minutes. Stir regularly and season with salt and pepper. The vegetables should be very soft but at the same time still have some of their texture. Serve immidiately or allow to cool down and serve it cold. Kalofagas is one of the blogs I subscribe to in my Google Reader and the other day there was a recipe posted that I knew straight away I had to try. Peter, who writes the blog, called it 'Army of Baked Vegetables', and you can have a look at it here. 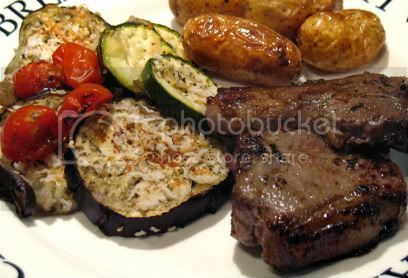 I made it last night, as I thought it would go well with our lamb chops, which I wanted to keep simple, seasoned with rosemary and garlic. I'm glad I did try it, the flavours are great. You get a real sweetness from the caramelised onions contrasted by the acidity from the tomatoes and the parmesan and breadcrumbs add a nice texture. Now my dish didn't look like an army, as I only had normal aubergines (eggplants), which of course meant they were much larger than the courgette (zucchini) and the cherry tomatoes I used. Plus I arranged them in a round flan dish as I halved the recipe and didn't have enough to fill my large square roasting tray. Of course that didn't affect the flavour though and I'll definitely make this again and maybe next time I'll have regimented lines, too. I could imagine these as a great side dish for a BBQ, as they taste just as good cold. It certainly doesn't feel like it. It's snowing outside and whereas I really do share the sentiment of dreaming of a white Christmas, I would rather have a green and sunny Easter. Also, when I was flicking through the TV channels yesterday afternoon, The Grinch was on. What's going on? 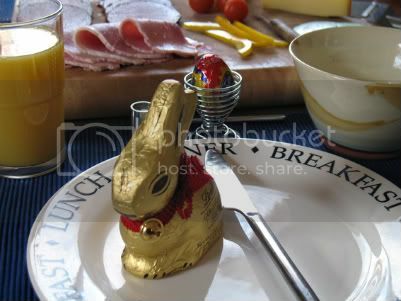 If it wasn't for the Easter Bunny on the breakfast table this morning I'd think I got my dates mixed up this year! Happy Easter to you all and I hope you got loads of chocolate eggs! We had Chicken Ceasar Wraps for dinner last night. I usually have them on days where I get home late from work as they are so quick and easy, but yesterday was one of those days where, despite having loads of time, I didn't really feel like cooking much. This isn't really a proper recipe as there are no measurements, I just do it by eye, but I'll try to write it down anyways. This makes four to six wraps depending on the size of your tortillas. Grill your chicken breast fillets and cut into slices. Mix the lettuce, dressing and parmesan cheese. 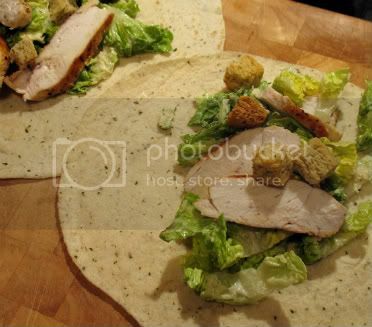 Divide the salad between the wraps, top with chicken and some croutons. Roll up and serve straight away. I was given an award yesterday. I couldn't believe it, but Maria from The Foodiva passed the Excellent Blog Award on to me. Thank you so much, you made my day! I never thought about anything like that happening, especially as I only started this blog at the end of last year and still consider myself pretty new at the whole blogging thing. It is wonderful to know though that there are people out there who enjoy reading my ramblings. I love Domestic Goddess in Training by Jules, it was one of the first food blogs I started to read regularly. Jules always seems to be cooking my kind of food. Then, I'd like to pass it on to Amanda at Little Foodies. I think it's great how Amanda is making food exciting for her kids and gets them to try different things. Finally, I've been following Andrew and Friedel, the Travelling Two, on their world travels by bike ever since they set off from London well over a year ago. Can a Giant Yorkshire Pudding ever be too big? Well, I have to say we struggled eating ours. 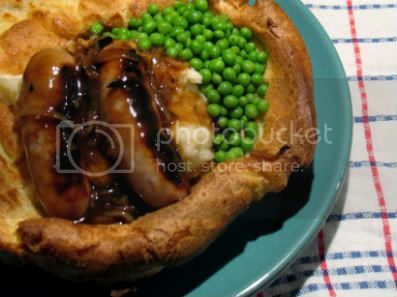 The plan was to make larger than normal Yorkshire Puds and fill them with mash, bangers and onion gravy, just like you can get them in a decent pub. 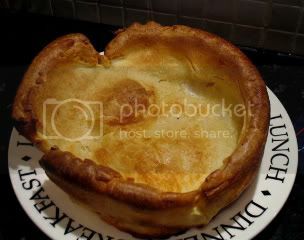 So rather than using a Yorkshire Pudding tray to make them, I rooted through my cupboards to look for a suitable pan. I wanted one that I would allow me to still make individual (rather than making one really large one and cut it up) but bigger than normal puds. After checking everything I had, I decided that my sandwich tins would probably work best, as their sides aren't too high. The results were great, but absolutely humongous. D and I were both a little overwhelmed when we sat down and saw what we had in front of us. Nevertheless, we persevered and conquered! This is the recipe that I now always use, it works every time and is based one one by Gordon Ramsey. The timings given are for standard puds. If you make them larger they will take longer, mine took about half an hour and if you make it even bigger to share between the family it might take as long as 45 minutes. Of course you can also use this batter to make Toad in the Hole. 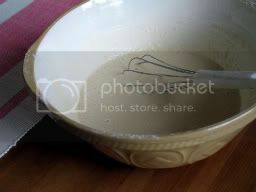 Whisk in the eggs and half of the milk until you have a smooth batter. Add the rest of the milk and whisk until smooth with no lumps left. Cover and rest for at least half an hour or you can make this the day before you want to use it. Preheat oven to 230C/Gas 8. Divide the lard between the pudding molds (the recipe makes 6-8) and place them in the hot oven. Once the lard is piping hot and starting to smoke remove the trays from the oven and carefully divide the batter between them, filling the mold about 2/3 to 3/4 of the way up. Immediately place them back in the oven and bake for about 12-15 minutes. Don't open the oven door during the first ten minutes of baking to avoid the puddings from collapsing. I'm not usually one for drinking in the afternoon, as it gets to about seven or eight in the evening and I'm ready for bed, but every now and then it seems like just the right thing to do. Sitting down with good friends, sharing a laugh and some drinks and just putting the world to rights. Yesterday was one of those days , some of my friends had planned a day out to Marsden, so of course I decided to join them. The weather ended up being quite hideous though, so we didn't really have much of a choice but to go and find shelter inside various pubs and enjoy a few of the local ales (as if we really needed the weather as an excuse). Now I'm not that much of a beer or ale drinker, I'm more of a wine and G&T girl, but one of the beers that I have really come to like lately is Kriek or Frambozenbier. Kriek is a dark red, cherry flavoured beer and Frambozenbier is pretty much the same colour, but it tastes of raspberries. You might think that sounds very strange and not good at all, but I'd say give it a try. Most of the people I've introduced to it have liked it. Unfortunately, by the time we had decided to have a meal in Marsden's Riverhead Brewery Tap ( a great pub and I've been told they do great food as well, if you're ever in the area) there was a waiting time of two hours for a table as we hadn't booked, so we just got on a train back home and went to the local Chinese restaurant. So, I was feed and watered (rather well I have to say) and tucked up in bed by ten last night after a really good day out. This last week I've somehow lacked motivation and inspiration in the kitchen. I've been feeling quite lethargic and as a result, I've mainly been pulling things out of the freezer (which I made and put in there in the first place, so it wasn't bad), but we also had take away pizza and some other unmemorable meals. I still feel a bit like that, so in order to try and stop us from having another bad food week, I have made a dinner plan for the next week or so. Of course I might not strictly stick to it as usual, but at least it should help. 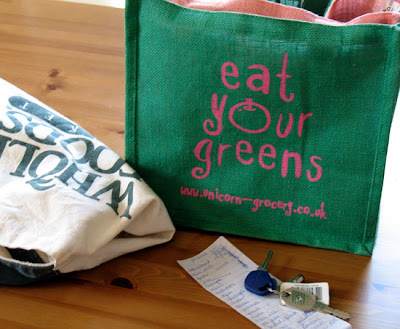 It'll also mean that I won't buy loads of food that then won't get used when I go shopping now. I love British puddings. Having grown up in Germany I was used to mainly having cold desserts, serving something warm for pudding is pretty unheard of over there. I've been wrecking my brain and can't really think of any German dessert that's served warm. I'm sure there must be one, so if you can think of one please let me know! Since moving to England ten years ago, I have come to love all the different warm desserts here. 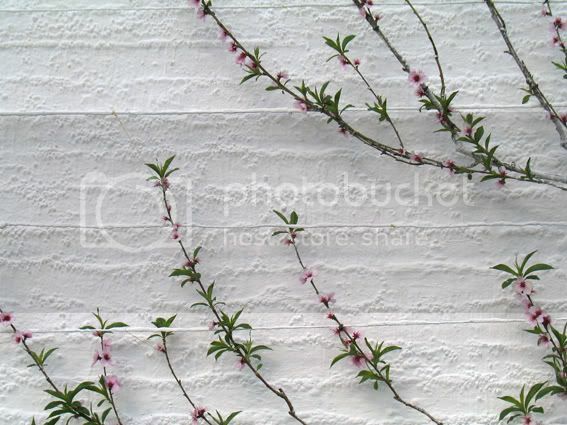 Yes, sometimes they are bit stodgy, but I guess that's what also makes them so comforting. Sticky Toffee Pudding, Jam Roly Poly, Bread and Butter Pudding and of course all the various crumbles - rhubarb, apple or cherry - I could eat them anytime, not just after a meal. To make it perfect I need some custard or sometimes I like the hot/cold thing and have them with some ice cream. 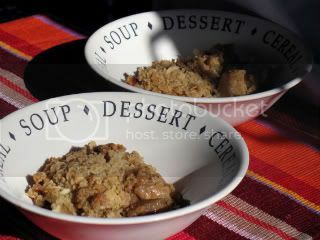 Yesterday, I never got around to post the Apple Crumble I made for pudding on Saturday. I got the recipe from a Farmer's Market cookbook last autumn. I had been picking Blackberries and was looking for different ways of using them, so the original recipe has a mixture of apples and blackberries, but of course you can use just about any fruit or combination thereof. It's really all about the crumble topping and this is the one I have come to use all the time. Preheat oven to 180C/Gas 5. Place the chopped apples in a large rectangular oven dish. Drizzle with lemon juice and sprinkle with dark brown sugar and cinnamon. Mix well so all the apples are coated. In a bowl mix the rest of the ingredients with your hands. Cutting the butter into the mixture until you get a crumble topping. Spread the topping fairly evenly over the apples. Bake for 25 minutes or until the fruit is bubbling and the top is golden. Serve hot with custard or vanilla ice cream. I obviously love cooking but always think that it is even more fun when done for friends. I find it extremely satisfying. There is just something special about sitting around a table with people you love, sharing good food, stories and some laughs and I'm sure most people feel exactly the same. We had some of our friends round for a curry night yesterday, so I spend most of the day shopping, preparing, stirring pots and generally enjoying myself. We had poppadoms, bajis and samosas (which I didn't make myself) to start with and then for the main I made a Chicken Korma, Lamb Rogan Josh and some Saag Aloo, served with rice and naan. I'm not a huge fan of Indian puddings though, apart from maybe some kulfi, so I stuck with a British classic and made Apple Crumble with Custard. Well, I think everyone enjoyed the food and generally had a really nice evening, I certainly did. 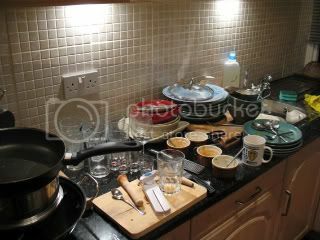 That was until I had waved the last taxi goodbye and entered the battle ground that was my kitchen. I usually don't mind not having a dishwasher that much as there are just the two of us and it's usually quickly done, but on days like yesterday at 2 o-clock in the morning washing up is the last thing I want to do. I did it however, as I knew I really didn't want to face that mess with a hangover and boy was I glad this morning! Mix the lemon juice, yoghurt, salt and one of the crushed garlic cloves in a large bowl. Add the cubed lamb, cover and marinade in the fridge overnight. Heat the oil or ghee in a heavy bottomed pan and fry the cumin seeds for about two minutes. Add the bay leaves and cardamom pods and fry for a further two minutes. Add the onion and the other garlic clove and fry for about five minutes. Now add the cumin, coriander and the chili powder, mix well and fry for another two minutes. The spices should become fragrant. 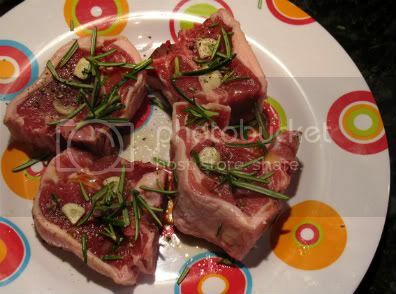 Add the lamb and all the marinade, stir well to combine with the spices and onions and fry for five minutes. Then ad the tomatoes, tomato puree and water and mix well. Cover and simmer for 1 hour, stirring occasionally. Then remove the lid and simmer for another 45 minutes until the sauce has reduced and the lamb is tender. In a pan cook the spinach with garlic, ginger, onions and the green chilies for about 5-10 minutes.Remove from the pan and blend to a fine puree and keep aside. 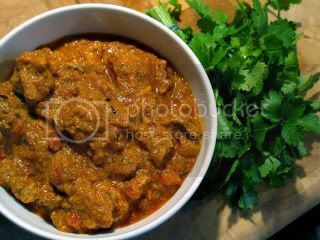 In the meantime boil the potatoes with salt and turmeric until done, approximately 10 minutes and set aside when done. 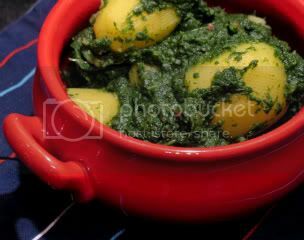 Heat ghee or butter in a pan, fry cumin seeds along with spinach-onion paste and simmer for a few minutes. Add the cooked potatoes, garam masala, coriander and cumin powder and a little water if needed.Simmer for few minutes till the potatoes absorb the flavor. 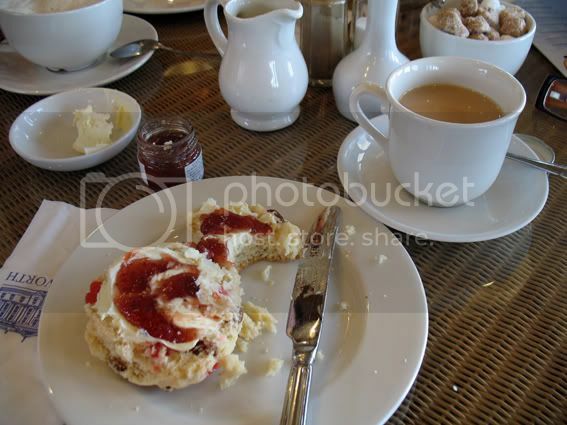 When I first started writing this blog, somebody mentioned to have a look the Foodie Blog Roll. Well, I did at the time but didn't feel ready to join, but yesterday I had another look at it, because I kept coming across it on other food blogs and I sent an e-mail to the Left Over Queen asking to add me and she did! So there. 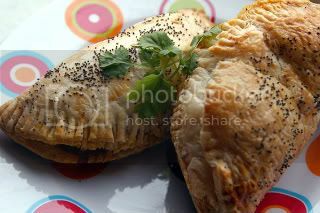 The Curried Chicken Parcels are one of those recipes that I came across in some magazine, I think it was something like Better Homes and Garden a few years ago. Often I see a recipe and cut cut it out and they disappears in the depths of my recipe folder, never to get tried (I think I'd need at least 10 years to make all the ear-marked recipes, even if I cooked something new each day and stopped collecting new ones now). Luckily that didn't happen with this recipe though. I tried it that week and never looked back. I just love it and my friend G. likes a plate full of these for his birthday every year. He not only likes them so much that he prefers them to a birthday cake, but he (jokingly of course) proposed marriage after trying them for the first time. Heat the oil and fry the onion, butternut squash and sweet potato for about 10 minutes. Add the chicken and fry until browned on the outside and nearly done. Add the curry paste and coconut milk and simmer for another 10 minutes. Take the pan of the heat and stir in the coriander. Roll out the pastry and cut out four 17 centimetre circles. Divide the filling between the pastry circles. Beat the egg and brush the edges of the pastry circles.Fold the pastry over to form a semi-circle and seal the edges by pressing them down with a fork.Brush the tops of the parcels with the rest off the beaten egg and sprinkle with the poppy seeds. Chill in the fridge for half an hour (I never really bother with this) and then bake in a pre-heated oven (200 C/Gas Mark 6) for about 30 to 40 minutes until golden.They are great hot or cold.